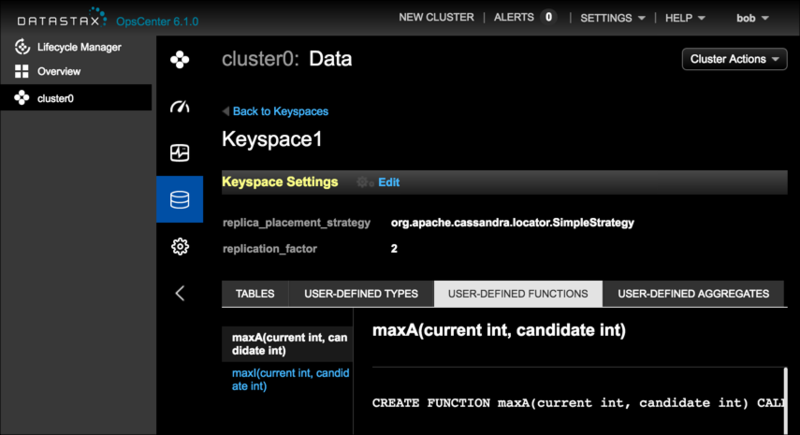 View the CQL for User-Defined Functions (UDF) within a keyspace in OpsCenter Monitoring. The CQL statements for user-defined functions are view-only in OpsCenter. Note: If OpsCenter authentication is enabled, users must have permissions granted in their roles to view the schema. See OpsCenter access roles overview. For information about creating a UDF using CQL, see Creating a user-defined function (UDF). Click the User-Defined Functions tab. Select the defined function to view in the left navigation pane for the keyspace. If there are not any user functions defined for a keyspace, No user functions in keyspace displays in the left navigation pane.